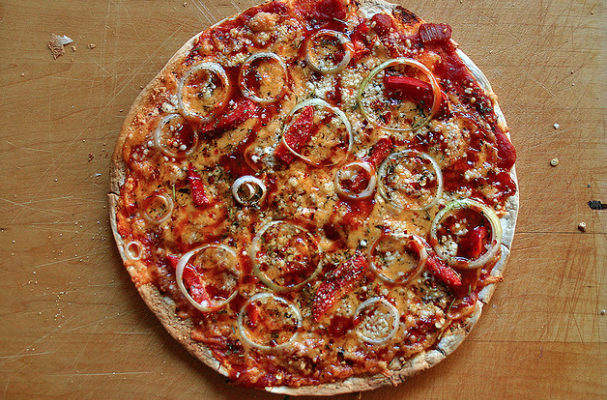 If you are in the mood for pizza but do not have the patience to prepare the crust, we have a recipe for you. Barbecue chicken tortilla pizza is the solution for (almost) instant pizza. Simply layer your favorite topping (in this case chicken, barbecue sauce and cheese) onto a flour tortilla and bake for 15 minutes. In other words, this recipe is genius. Most people have the ingredients for pizza in their pantry and the tortilla is the perfect alternative to making a crust from scratch. So the next time you are considering a frozen pizza or delivery, give this barbecue chicken tortilla recipe a try. Step 2: In a small bowl, combine the chicken with 3/4 cup of barbecue sauce. Mix until the chicken is evenly coated. Step 3: Place the tortillas on a baking tray. With the remaining 1/4 cup of barbecue sauce, spread it evenly between the six tortillas followed by a light sprinkling of mozzarella cheese. Add the chicken and then top with sliced red onion and more cheese. Step 4: Bake for 15 minutes or until the tortillas become crisp. Allow to cool for a few minutes and garnish with cilantro. Cut into wedges and serve hot.